Mitsubishi Motors Corporation (MMC) will present the world debut of the Outlander PHEV Concept-S at the 2014 Paris Motor Show*. The Outlander PHEV Concept-S is a concept model based on the Outlander PHEV 4WD SUV plug-in hybrid vehicle. MMC also will be displaying total of 11 vehicles (5 on press day) including the Outlander PHEV rally car that competed in the FIA Asia Cross Country Rally 2014, European specification production models, the i-MiEV and other electric powered vehicles (electric vehicle (EV) and plug-in hybrid EV (PHEV)). 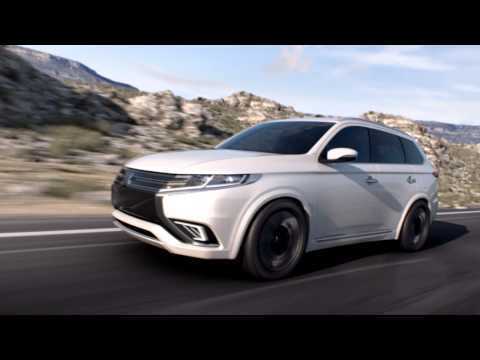 The Outlander PHEV Concept-S is a concept model presenting a special design package for the production Outlander PHEV.The exterior and interior design are created under "Sporty and Sophisticated" design theme. The design expresses driving pleasure by delivering powerful and agile driving performance as well as quiet, advanced and high quality driving performance provided by its Twin Motor 4WD and Plug-in Hybrid EV System. Meant to symbolize the functionality and reassuring safety inherent to Mitsubishi Motors' SUVs, the front end design shields the Three-Diamond mark with bold chromed accent moldings on either side - a three dimensional effect - in a further suggestion of motion. Wraparound headlamps contribute themselves to a sense of dynamism sweeping gently up and outwards. This "protective theme" continues at the rear where similar symbolic chrome accents – topped by elongated combination lamps - run from tailgate to wings meant to express dynamic and innovative styling as if bracing the vehicle for better safety. The body color uses a brilliant "Platinum White" with glass flake finish. Contrary to the sparkling exterior design, the "Black & Burgundy" color scheme interior design offers a refined quality passenger compartment. Furthermore, the seat upholstery forms a three-dimensional surface with horizontally-ribbed cushioning providing superior fit, while the use of trimming lines is formed so as to gently follow the body contours holding occupants snugly in place. Silver accents of the trimming lines, curving around the seat, further enhance the perceived quality of the interior.